We’ve had a few brilliantly sunny days in Vancouver so it’s fitting that the first of our new Spring yarns arrived today. It’s the gorgeous Noro Taiyo, an aran weight yarn that’s 40% cotton, 30% silk, 15% wool and 15% nylon. A great addition to our Noro collection. I have to say, I love this scarf. It’s quick to knit, the colours are superb and it’s a pleasure to wear. 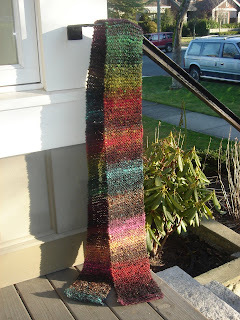 I used two skeins of Iro, no. 43. Just cast on 18 stitches with 7mm needles and knit until you’re done. And now on to our special of the week which is Alessandra Gemma, on sale at 30% off. Gemma is a beautiful ribbon effect yarn that comes in gorgeous vibrant colours. Check out all of our current and upcoming specials right here. There are some great bargains waiting for you. This entry was posted on Tuesday, January 22nd, 2008 at 6:33 pm	and is filed under Uncategorized. You can follow any responses to this entry through the RSS 2.0 feed. Both comments and pings are currently closed.